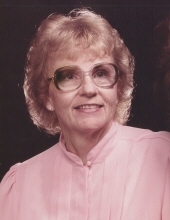 Dorothy June Thompson Epperly was born in Whittier on June 5, 1925, and went into the presence of Jesus Christ her Savior on April 10, 2019. Her parents were Walter D. Thompson and Callie Miller Thompson. She graduated from Whittier High School in 1943. She worked as a bookkeeper, along with her cousin Evelyn Moen, at First National Bank in uptown Whittier. She was predeceased by her husband of 70 years, James Oliver Epperly, in 2017. Dorothy was a beautiful pianist. She was a church accompanist for most of her life, and she taught piano lessons and accompanied choirs for many years at Christian schools. She especially enjoyed the years that she played the piano while her sister, Gerry Morris, played the organ at Grace Evangelical Free Church in La Mirada. She was a Sunday School teacher and church secretary, and she made the best jam and pies from the luscious boysenberries she grew in her backyard. She and Jim spent a year doing missionary support work for Far East Broadcasting in Saipan. She then worked for FEBC in La Mirada for 14 years before retiring. She gave sacrificially of her time and resources throughout her life. She was a member of Grace EV Free Church of La Mirada. Dorothy was a hardworking and loving mother and is survived by her 6 children - Mary Anne (Earl) Friesen of Colorado Springs CO, Carol (Paul) Brown of Santa Rosa CA, Ginny (Jim) Boyle of Fayetteville NC, James Epperly of Albuquerque NM, Julie Kemper of Houston TX, and Barbara Epperly of La Mirada CA; 13 grandchildren; 22 great-grandchildren; close niece Billie Lee Bostrom of Placentia CA; and sister-in-law Helene (Ken) Steele of Fullerton CA. Memorial donations may be made to Grace EV Free, 12717 Santa Gertrudes Ave, La Mirada CA 90638; or FEBC, PO Box 1, La Mirada CA 90637. To send flowers or a remembrance gift to the family of Dorothy June Thompson Epperly, please visit our Tribute Store. "Email Address" would like to share the life celebration of Dorothy June Thompson Epperly. Click on the "link" to go to share a favorite memory or leave a condolence message for the family.